Got nothing special for you today. Just some random doo-dads. Went to the 29 year anniversary of my junior high school graduation this weekend. Yep, 29 years. It seems my school, Earl Grey Sr, was the inspiration for the DeGrassi Junior High TV show. This was because of the role of the school librarian, the late Bruce Mackey. I have many strong memories of Mr Mackey, who always exuded that most profound of teacherly emotions: he cared. Both my sister and I were graduating valedictorians of that school, 2 years apart. My later friends Ed Wong and Greg Beiles would fill the intermediate years. Rumour has it that Greg ripped off my speech, which was fine, because I ripped off Ed’s speech. And Ed, of course, ripped off my sister’s speech. 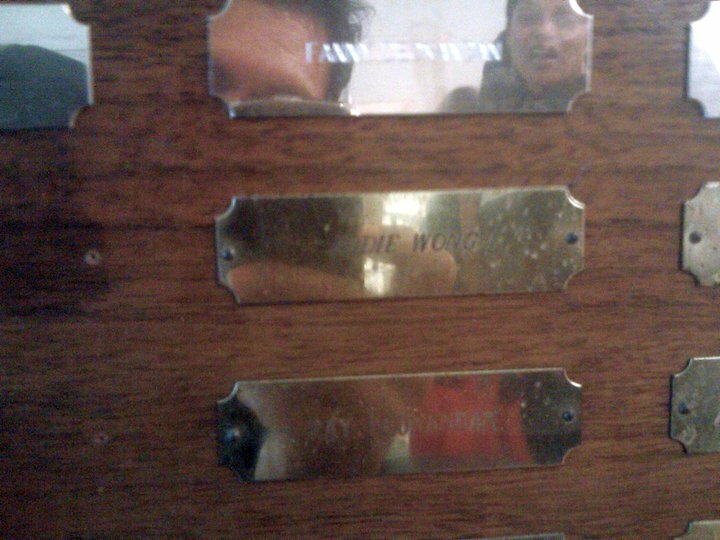 Yep, the reflection in the top plaque is that of yours truly taking the photo, with my sister Phani looking over my shoulder, for some reason appearing horrified. This weekend I also gave a workshop at the International Women and Children’s Health conference in Hamilton, Ontario. The hotel I stayed in made out my receipt to “Raywag” Deonandan, which I find sort of amusing. A Google image search for “Raywag” reveals a plethora of fine-looking Asian babes, as well as some other weirdness. But the weirdest part was that my hotel room’s TV was stuck on the hunting channel. I keep waking up to the most horrific scenes of animal murder. I don’t know why I’m telling you this, but there it is. There’s a new article up at Skiffy.ca, this time by the Red Parrot. I found this paper by Anand Boodram, about Indo-Caribbean identity. He cites me a lot, which is nice. I’ve finally uploaded some long-queued photos to my flickr.com page. These include pics from my 2008 trip to Guyana, my trip to Guyana earlier this summer and my trip to Guyana just a couple of weeks ago. Hmm, it seems I’m spending way too much time in Guyana. Oh yes, there are also a few pics from the junior high school reunion this past weekend, and a handful from Hallowe’en. Enjoy!